The International Energy Agency released today an interesting report urging once again its members to work on technologies that might solve the energy-climate equation. Stating that it is now or never, the experts believe that if nothing was done CO2 emissions would soar by 130 percent by mid century when in the opposite, they need to be halved. To solve this equation would require to dedicate one percent of global GDP. The issue is complex, but the IEA provides both solutions and data. The world faces the daunting combination of surging energy demand, rising greenhouse gas emissions and tightening resources. A global energy technology revolution is both necessary and achievable; but it will be a tough challenge”, said Nobuo Tanaka, Executive Director of the International Energy Agency (IEA) today in Tokyo, at the launch of the latest edition of Energy technology Perspectives (ETP). The Agency’s leading biennial publication responds to the G8 call on the IEA for guidance on how to achieve a clean, clever and competitive energy future. The book is built around three sets of global energy technology scenarios. These are a Baseline (business-as-usual Scenario), a range of ACT Scenarios showing how CO2 emissions could be brought back to current levels by 2050, and a set of BLUE Scenarios outlining how they could be reduced to 50% below current levels. 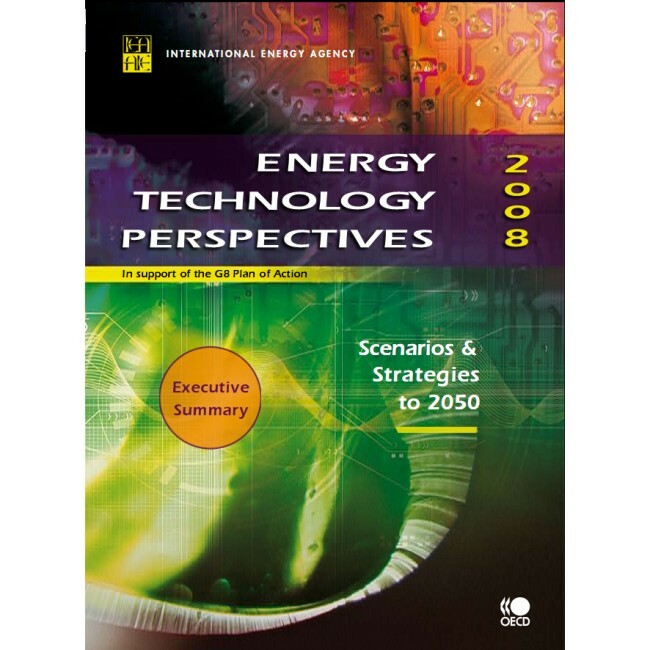 ETP 2008 also contains global roadmaps showing how each of 17 key advanced energy technologies would need to be developed and deployed to deliver the ACT or the BLUE outcomes. If governments around the world continue with policies in place to date – the underlying premise in the ETP Baseline scenario to 2050 – CO2 emissions will rise by 130% and oil demand will rise by 70%. This expansion in oil equals five times today’s production of Saudi Arabia. “Such growth of oil demand raises major concerns regarding energy supply access and investment needs”, said Mr. Tanaka. In the Baseline scenario, the power generation sector accounts for 44% of total global emissions in 2050, followed by industry, transport, the fuel transformation sector and buildings. “ETP 2008 demonstrates the extent of the challenge to reverse these trends. To bring CO2 emissions back to current levels in 2050, all options are needed at a cost of up to USD 50/t CO2”, Mr. Tanaka said. No single form of energy or technology can provide the full solution. Improving energy efficiency is the first step and is very attractive as it results in immediate cost savings. Significantly reducing emissions from power generation is also a key component of emissions stabilization. But even this is not enough. The BLUE Scenarios would provide even deeper cuts. “Emissions halving implies that all options up to a cost of USD 200/t CO2 will be needed. This is based on a set of optimistic assumptions for technology development. Under less optimistic assumptions, options that would cost up to USD 500/t CO2 may be needed. Total additional investment needs in technology and deployment between now and 2050 would amount to USD 45 trillion, or 1.1% of average annual global GDP over the period”, Mr. Tanaka stressed. We would need a virtual decarbonisation of the power sector. Given the growing demand for electricity, this would mean that on average per year 35 coal and 20 gas-fired power plants would have to be fitted with CO2 capture and storage (CCS) technology, between 2010 and 2050 at a cost of USD 1.5 billion each. Furthermore, we would have to build an additional 32 new nuclear plants each year and wind capacity would have to increase by approximately 17.500 turbines each year. This also implies numerous issues that would need to be overcome, such as the NIMBY-attitude (not in my backyard), the need to boost the numbers of engineering and technical graduates, and to resolve the questions on the availability of sufficient geological formations for captured CO2 or geologically stable sites for nuclear reactors or waste storage. In addition to all this, we would also have to make an eightfold reduction of the carbon intensity of the transport sector. This represents the most difficult and costly step due to the ongoing rapid demand growth and limited potential based on existing technology. CO2 capture and storage, renewables, nuclear energy and energy efficiency – all must play a much more important role. New insights from this study include recognition of the important role for CO2 capture in industry, the potential for electrification of end-use sectors in combination with CO2-free electricity, the need for further development of solar electricity, and the importance of second generation biodiesel. To conclude, as the IEA states, we can’t afford to dismiss any solution as the trend of both greenhouse gases emissions and energy consumption are on the increase if nothing was done to reverse the situation. This is most worrying as we have to cut both of them in dramatic ways. I hope this report will be heard soon and that true leaders will emerge and take up this huge challenge. To learn out more, please refer to the executive summary or buy the report’s full version. None of these calls to my knowledge were heard… I am quite pessimistic and thinks that this one won’t be heard either. I say: Everybody is starting to sing to the same tune. It’s important to show the public the agreement/alignment of big institutes on this matter. Then, it needs to be framed not as something costly, but as something exciting to do. It’s all psychology. I too am pessimistic. We will talk and squabble about what to do for many more years to come. Until the perceived benefit exceeds the cost companies and governments won’t make the necessary changes. As a world we haven’t figured out how to feed everyone let alone reduce our carbon impact. Well, Daryl, I am a bit pessimistic as well since the previous calls for action were just ignored. Here, a famous environmentalist – Nicolas Hulot – said yesterday on TV that the Grenelle wasn’t working and that progress were very low, much too low and that the objectives were reduced. Edouard, how does the *general* concept of Grenelle relates to the Dutch “Polder Model”? Can you point out similarities, differences? I can’t find a good description of how Grenelle works, but I’m really interested. Sadly, my understanding of French is practically zero. The Grenelle de l’Environnement (and not the 1968 one) is similar to your Polder Model as it associated companies, trade unions, the government but also NGOs. As you can imagine, NGOs really were important in such topics as they have been quite in advance of the majority of people. Most fortunately for you, the Ministry of Sustainable Development and Energy has a page in English on how the Grenelle works. “If we take the report’s marginal cost estimate of $200 to $500 per ton for mitigating carbon dioxide, then a simple estimate of the full costs from a frozen technology baseline would be an additional $210 to $530 trillion above the $45 trillion cited in the report. Yes, you read that right.